A well kept, fruitful vineyard can be a thing of beauty. The meticulously dressed rows and the lush fruit require careful pruning and cultivation. It is no job for an amateur, that’s for sure. Vineyards were common in the agriculture of the ancient Near East, Jesus used them as analogies for teaching spiritual truths. What causes a branch to bear fruit? It’s connection to the vine. If a branch is not bearing fruit, it is because it is dead. And Jesus makes a very strong point about fruit bearing. 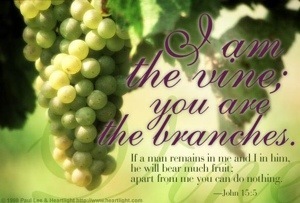 A branch will bear fruit, not by sheer will, but by staying connected to the vine. If we are not bearing fruit, it is a sign that we are no longer connected. Bearing fruit doesn’t keep you connected; being connected produces fruit! Another fact of life that Jesus draws attention to is that in a vineyard, there is a season where there is a whole lot of cutting going on! The dead branches are cut off because they take up space needed for the live branches. But even live branches get pruned so they can produce more fruit. Why is that? It’s because fruit is only produced by new growth. The point is that we cannot rest on old fruit. Pruning keeps us from thinking that we are the ones producing the fruit. Apart from the vine, we can do nothing. So what is this life giving flow that comes from the vine to produce spiritual fruit? His Words abiding in us! As we stay in Him, and His word keeps abiding in us, we WILL bear much fruit. I want to be clear in this. Just as we cannot bear fruit apart from Him, we cannot help but bear fruit if we are abiding in Him. Real fruit proves we are disciples, and a lack of fruit proves we are not disciples. How serious is this? Well Matthew 28 says our mission is to make disciples, and Acts 11 says the disciples were first called Christians at Antioch. If we have no fruit, we are not disciples, and thus are not Christians! Again, this is not something you can accomplish by your own effort. You are either connected or you are not. And the proof is in the spiritual fruit. It is fruit from a divine source, because da’ vine is divine!